Entropy is a quantity that states the microscopic state of the system so that it can not be known directly. Which can be calculated only entropy changes. Much like an internal energy change in the first law of thermodynamics. During the adiabatic process, no heat enters or exits the system (gas). Since Q = 0 then ΔS = 0. The system entropy is constant. What about adiabatic compression? During adiabatic compression, no heat enters or leaves the system (Q = 0). Therefore the entropy of the system is constant. The Carnot engine absorbs the heat of 2000 J at 500 K, releases heat at 350 K. Calculate the heat released, and the change in total entropy for one cycle. If the system receives heat, Q is positive, if the system releases heat, Q is negative. The =? for this case is the Carnot engine. During one cycle, the Carnot engine undergoes two reversible isothermal processes (isothermal expansion + isothermal compression) and two reversible adiabatic processes (adiabatic expansion and adiabatic compression). During expansion and compression, no heat enters or leaves the system (Q = 0). Since Q = 0, entropy changes during the adiabatic process = 0. During one cycle, the Carnot engine undergoes two reversible isothermal processes (isothermal expansion + isothermal compression) and two reversible adiabatic processes (adiabatic compression and adiabatic expansion). 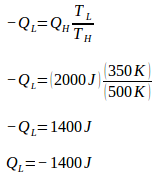 During adiabatic expansion and compression, no heat enters or leaves the system (Q = 0). Because Q = 0 then the entropy change during the adiabatic process = 0. Based on example number 2 and example number 3, the total entropy change for the reversible process = 0. In the reversible process, the total entropy is always constant. Water at 26 °C is mixed with water at 22 °C. The water mass is 2 kg. Calculate the change in water entropy. Hot water and cold water are mixed in a well-insulated closed container. Heat transfer is an irreversible process. The water mass is the same, so the final temperature = 24 oC (26 oC + 22 oC / 2 = 48 oC / 2 = 24 oC). Hot water releases heat, so Q is negative. Cold water absorbs heat, so Q is positive. Although the partial entropy of the system decreases (-56.107 J/K), the partial entropy of the system increases in larger quantities (+ 56.486 J / K) so that total entropy is always increased (+ 0.379 J / K). The increase in total entropy in the irreversible process is not only applicable to heat transfer between hot and cold water mixtures analyzed above but also applies to all cases examined by scientists. Total fixed entropy if the process occurs reversibly. If the process occurs irreversibly, then total entropy always increases. In an irreversible process, the total entropy of the system and the environment is always growing. This statement is a general statement of the second law of thermodynamics. The second law of thermodynamics is different from other physical laws. Usually, the laws of physics are expressed regarding equations (Newton’s law) or in the form of the law of eternity (the law of conservation of energy).